Urban planners are always looking out for construction practices to save trees. After all, trees provide immeasurable benefits to communities. However, tree roots often grow well beyond their initial planting area. This growth can wreak havoc with anything that lies in their path. Sidewalks are particularly susceptible to upheaval or damage from tree roots. Over time, they become uneven, causing tripping hazards for pedestrians. Enter TripStop™, a great example of a construction practice to save trees. 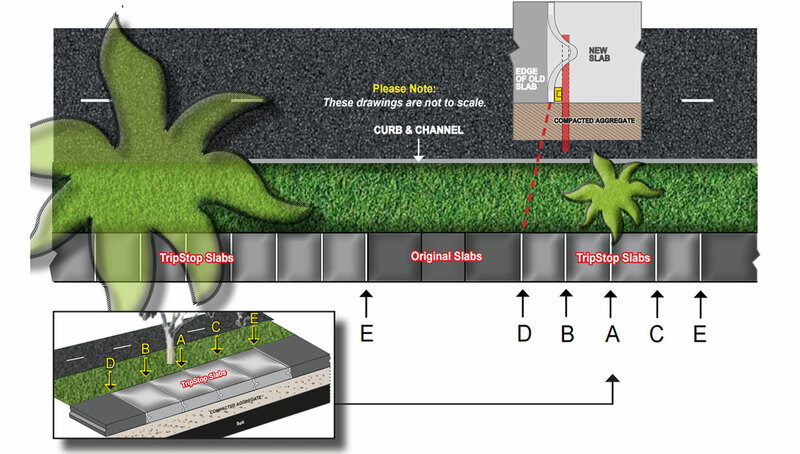 TripStop™ is an articulating sidewalk joint that eliminates trip hazards between each section. Whenever one sidewalk section rises, the adjacent panel rises up as well to meet the rising section. The difference in height between each panel will always be less than a quarter inch, making the sidewalk safe and compliant with the Americans with Disabilities Act (ADA). So how is TripStop™ a construction practice to save trees? Expanding tree roots are one of the main reasons sidewalks become uneven over time. If the panel gap exceeds a quarter inch, the sidewalk must be repaired or replaced. Sidewalk grinding is a short-term solution, but is unattractive and does not address the root problem. Eventually the sidewalk will need to be replaced. When sidewalk reconstruction takes place, tree roots often have to be trimmed in order to achieve a flat sidewalk free of trip hazards. While most trees can survive a one-time intrusion, in some cases the replacement process may be required again in as little as five years. This will result in the loss of beautiful mature trees. Installing TripStop™ is a construction practice to save trees. Sidewalks will last through their approximate 75-year lifespan without replacement, significantly reducing the amount of stress placed on nearby trees. In addition to being a construction practice to save trees, TripStop™ also reduces the burden of landfill dumping and construction equipment activity on the environment. The average tree in North America produces nearly 260 pounds of oxygen each year. Therefore, we should look for construction practices to save trees and keep our environment green.